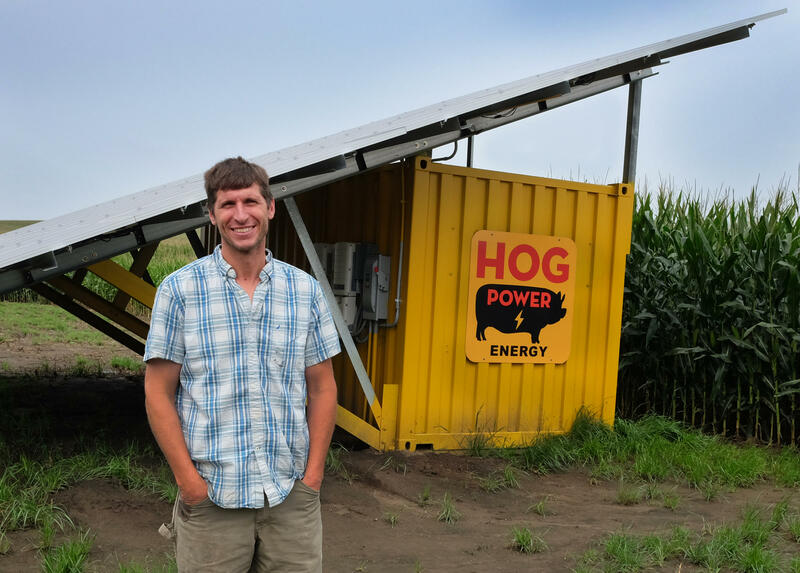 Dolf Ivener stands in front of a Hog Power self-contained solar generator. Dolf Yeah, we’re in the lee of the solar panels. Mark This is Dolf Ivener, owner of SunCrate Energy. Dolf Birds love solar panel racks for nests. Mark We are in a small solar panel infrastructure behind an apartment complex near where Sioux City begins to blur into rural living. As well as owning SunCrate Energy, and HogPower Energy, Dolf farms and runs a construction company. He identifies as a hog farmer. Dolf I find solar panels and corn planters, they each have a special place. Birds love them. Melody My name is Melody Jean Walbricht. Mark Melody lives about 2500 miles from the shade of the solar panels Dolf and I stood in. Melody Oh, you’re in Iowa. Oh, well, I was born in Iowa, also. Mark Our both being Iowans was pure coincidence. Originally from Osage, Melody moved to Puerto Rico with her husband 40 years ago. I was on one side of a phone call to the SU Manuel Ortiz school in Yabacoa, Puerto Rico, and somebody handed her the other side. Her granddaughter is a student at the school. My interest in the school goes back to Dolf, and his interest goes back to Hurricane Maria, an Atlantic hurricane whose winds reached 175 mph and caused the deaths of over 3000 people in Puerto Rico. For the survivors, it’s been a difficult recovery. Melody Oh, trees everywhere. Trees, power lines, poles… it was really a mess, and thanks to the teachers and some of the parents, well, every day they would come and pick up and try to get things back in order so that school could go ahead and be open again as soon as possible. Mark But then a road to the school collapsed, preventing the school’s re-opening and, as it turns out, threatening a permanent closure. Mark The public-school system in Puerto Rico was under stress before Hurricane Maria struck in 2017. The New York Times reported that in 2016, 167 schools had been shuttered. Following the hurricane, 265 more were closed. Lack of funding and emigration from the island have put pressure on the system, as have political pushes for privatization and wavers, forcing consolidation. Though rural towns in Iowa and beyond haven’t all together suffered a natural disaster as has Puerto Rico, waning populations and funding challenges have forced consolidation in the countryside. For Dolf, who intentionally works with solar power to provide a degree of independence to folks in rural parts or the world, school consolidation represents a loss of an ideal. Dolf you know, when you drive through every small town in Iowa, you look at the school and it’s the Shleghorn… you know, go down the list of five towns in one, and the town that didn’t get the school, kinda just, you know, kinda just drying up. Mark Behind the saving of the school, is another story. Dolf Because I’m a hog farmer from Iowa, right? Hog farmer from Iowa calls up and says, “hey, I want to do this,” right? Mark Before there was SunCrate Energy, there was Hog Power Energy. Dolf I came up with this idea for hog confinements. Dolf all of the sudden, the pull to move to town, became less of a pull. Mark get in touch with the secretary of education in Puerto Rico? Dolf Everything is created through personal relationships. I made a personal relationship with a man at Black and Veatch in Kansas City. I accomplished all kinds of tasks for them to prove I was competent. And then they opened their rolodex of numbers. And one of their… they are the engineering company of choice for Tesla for installing all of the supercharging stations around the United States. Dolf Black and Veatch called. Mark Called the Secretary of Education in Puerto Rico. And with their name and reputation, in addition to Tesla’s and to Canadian Solar’s, both of whom also partnered with Dolf for this project. Dolf So that then perks up the Secretary of Education, and she’s like. “Yeah, we’ve got the biggest players in the world coming to help our little school in, ya know, in Yabacoa, Puerto Rico. Dolf these larger engineering companies, um, their bread and butter has been huge massive projects, like a coal-fired plant that is a billion dollars, takes 4 years to build it, right? I mean those are awesome projects, and those projects are starting to go away. Mark The United States Energy Information Administration estimates that to build a 650 megawatt coal-fired power plant with 30% carbon sequestration that will go online in 2021, the cost would be 3.3 billion dollars. To build enough solar plants with fixed panels to create the same amount of power, it would be $1.2 billion, and it would go online in 2019. Giving solar an advantage. And with Tesla and companies like Tesla ramping up production of batteries, batteries that can communicate when networked, the ability to create and store power then use it when needed is here. Dolf’s SunCrate, or Hog Power box, proves that smart microgrids can supplement major grids. The proof is being shown every day at a small school in Yabacoa Puerto Rico. Dolf That took me six week. Six weeks of my life! Mark Calling one company and explaining you want to ship a container you own. Dolf What do you mean your shipping container? Mark We use our shipping containers. Dolf I thought we had this conversation. Mark And within 24 hours his crate was on its way to Puerto Rico. Once there, nothing went smoothly, but Dolf and his team persisted, setting up the equipment, training teachers and administrators on how to use it, racing against the clock as the Secrectary of Education as well as folks from Tesla and the other companies were coming down to see this battery go online, giving life back to a school that had been closed for a traumatic year. Dolf This task had to be completed when that limo, that black Suburban rolled in. Mark But the work was bringing them right up to the that time. And then, once done, the battery had to charge. For the system to be fully utilized, the battery must be fully charged. But the Suburban has arrived. Speeches are being given. Dolf And, literally, as the Secretary of Education calls my name, “Dolf, come up and tell us about it,” the screen blinked. And, right, I have this big flat screen TV that shows the schematic on the battery charge and it just flashes 100%, and it was just like “Boom!” Oh! Don’t stand next to me because lightning could strike me, cause, man, I got the hot hand. So, I just walked up there and, we, “OK turn it off,” and you kill it, and none of the lights go down and the school is still running, and the air conditioners are humming, and it’s like “Yep. Yeah, we totally knew this would happen all the time. We had it all. This is great. And these microgrids, you know?” It’s just, you know, we got really lucky. Mark Dolf has stayed in touch with the folks at the school and can view the workings of the crate on his phone. The kids haven’t had to be sent home for loss of power even as Puerto Rico continues to struggle with its macro grid. And folks lie Melody, who see this technology at work every day, are now thinking anew. Melody I’m looking forward to doing the same thing with my home. I’m all for clean energy. What’s all the buzz about solar power? Find out as Gretchen Gondek speaks with Kim Clay, Area Specialist, Rural Development, U.S. Department of Agriculture about the upcoming Solar Energy Conference on September 2nd in Le Mars. Dolf Ivener of King of Trails will also speak about his role in the conference and harnessing the power of solar energy. Alexis: Technology....for better or for worse is here to stay...giving us instant access to answers and beyond what is in our textbooks. It is entertaining and interactive and we seem to be born knowing how to use it. Jami: We like using technology, plain and simple. It allows us to go beyond what we thought was ever possible. Alexis: Personalized instruction sounds great on paper, but the reality of large classrooms and limited resources is what students are often faced with. This week on The Exchange, we hear from the candidates for the Sioux City school board elections, which are being held September 12th. We held a roundtable discussion at the Sioux City Public Museum on Wednesday, August 30th. This program is part of Siouxland Public Media's collaboration with the League of Women Voters of Sioux City. The league is holding its public debate with the candidates on Tuesday, September 5th from 7:00-8:30 p.m. at the City Council chambers in downtown Sioux City. The debate and forum is free and open to the public. Jerry Uelsmann is a master of the darkroom who, before the creation of image editing software, saw the possibilities of combining photographic images from separate exposures into a single, seamless composition. Because of his deftness, when we look at his images from a context where digital editing is expected, we still feel a sense of awe and wonder.